All of our adblue tanks are rotationally moulded and manufactured in our UK factory, giving strength and stability to make our Adblue tanks suitable for all surroundings. All of our Adblue range are fully approved tanks and dispensers which means we can cater to all your industrial, domestic and agricultural needs. Weatherproof, corrosion resistant, all of our tanks are manufactured in our UK factory from high grade polyethylene. Our Adblue tanks also have high impact strength and the latest UV stabilisation packages. If you're looking for somewhere to store your Adblue, then look no further than our 3000 litre adblue tank. Although our products are competitively priced, it's manufactured from the highest quality plastic. Our 3000 litre Adblue tank is weather and impact resistant, so you can be assured of buying a high quality product. 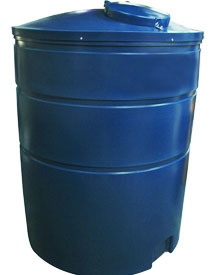 Its cylindrical shape and indented ribs create a strong durable tank ideal for all agricultural and commercial environments.